When President Richard Nixon held his meetings with Chairman Mao in Beijing in February 1972, at his side was a young U.S. diplomat serving as his principal interpreter: Chas W. Freeman, Jr. 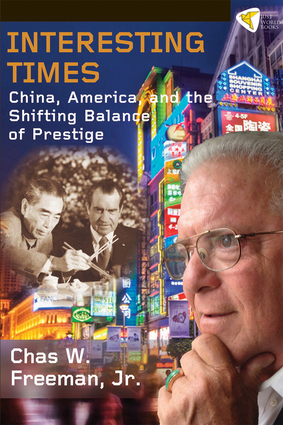 Interesting Times: China, America, and the Shifting Balance of Prestige presents Ambassador Freeman's most brilliant (and often bitingly witty) on developments in China and the U.S.-Chinese relationship, 1969–2012. Subjects include issues like Taiwan, other strategic issues, and differences over human rights, economic, and trade policies that confronted the world’s two most powerful countries throughout those years. Ambassador Chas W. Freeman, Jr. served for three decades as a U.S. diplomat, completing his government service with a term as Assistant Secretary of Defense for International Security Affairs. He was Pres. Nixon's translatpr during Nixon's breakthrough visit to Beijing; he was U.S. Ambassador to Saudi Arabia during Operations Desert Shield and Desert Storm; and he negotiated (in Spanish) with Fidel Castro the deal that resulted in the withdrawal of thousands of Cuban forces from Angola. Since his retirement, Freeman has continued to offer his insight and analysis on issues of international relations and U.S. foreign policy.